Maria Luisa (or as she wants you to call her, Malu) is a Mexican American girl who loves punk culture (zines, clothing, music). She is uprooted from her life in Florida and moves with her mother to Chicago, where she comes up against a principal and social queen who hate her punk look, her punk band, and pretty much everything about her. With the help of her dad, as well as people in her neighborhood, Malu learns to be herself and embrace the many aspects of her personality–punk, the Spanish language, and her Mexican heritage. When people say that ‘we need diverse characters in YA literature’, this is truly it. 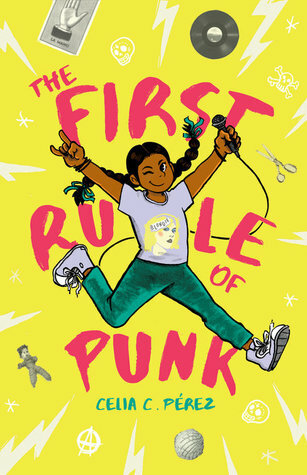 I have read many books with punk characters as well as many books with characters of color, but never a YA book that blends it together quite like this. I also loved the inclusions of Malu’s zines all throughout the novel, which really gave it a touch of realism. I also loved the fact that I learned quite a bit about Mexican culture through reading this, without it sounding heavy-handed or preachy. Do read this this. You’ll thank me.